This hostel was excellent! Joanna, the host, was extremely helpful with any questions we had about Luang Prabang or what to do in the area. Very quiet, clean, and comfortable. We stayed here 4 nights. Really enjoyed our stay here. Room was nice and clean. Super close the Utopia and not a far walk from the night market. Owner was very lovely. When we checked in they had overbooked the dorms so gave me and my mate a twin room for no extra charge which was good. Was clean and good air con! There is nowhere really to chill out or meet new people. Sometimes no one at reception but still all good. Quite a bog standard and boring hostel (sorry). Joanna is nice, but there’s zero atmosphere and we had some issues. The fan sparked and blew the fuse for all the lights, then started smoking when I tried to turn it on. 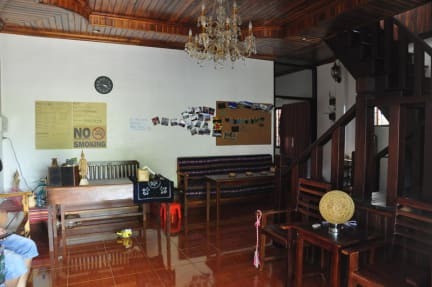 She let us leave our belongings when we went on a homestay for a night, which was kind. She doesn’t provide much info/maps. Rooms are fine and it’s very quite and cheap. Cleanliness is good, stayed 6 nights they changed the towel & linens after 3 days. Room was cleaned everyday. Hand soap & toilet paper provided. Quite neighbourhood, good for us. Wifi only good at the reception area, not in our room. Staffs are nice but very hard to communicate as they don’t speak much English, even for a basic conversation. 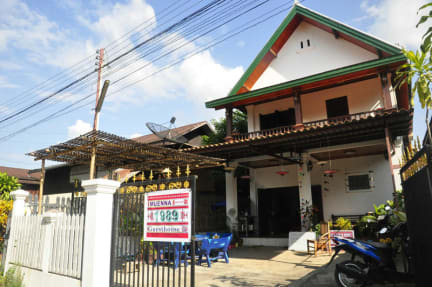 Location is a bit far from all attractions but still walkable, best to rent bicycle/scooter. You only given locker key, no room and house key. The beds are very comfortable! Staff is friendly but they do not understand english very well, which makes communication difficult, also they are a bit disorganized. My bed did not have clean sheets and I asked to change them the next day. In the description says they offer coffee and tea but it is not true. They close the Guest House at 11pm or even before. They only let me know when I was leaving the property to have dinner. Be aware that in the check in they are going to ask you to change dollar into kip on the city, but when you get back to make the payment, they will convert the amount back in dolars again in a very unfavourable rate, which makes no sense. No atmosphere here, only me in the room, didn’t meet anyone in 3 nights. We arrived, hostel was full. They put us in the managers room which hadnt even been cleaned. We were really uncomfortable the whole stay as the manager slept on the couch. The bathroom smelled like hell and also hadnt been cleaned. Couldnt ask to clean as no one understood us. We changed our own beds. Hostels blankets etc were in our room so they kept coming in. Staff came in to shower at 6am and left light open. 3 people were sent away as they had ooverbooked. Big confusion. Avoid at all costs. We booked 2 beds and payed already in the internet but when we came they were full and didn't gave us our room and didn't help us to find a solution. Just ignored us.